Possessing such remarkable visual capabilities, humans believe they can always perceive and understand the shape of objects correctly. Under the phenomenon of visual illusion, however, what humans see differs from reality. Impossible objects are a type of 3D visual illusion that are 2D pictures which give the impression of having inconsistent 3D structures. But real 3D objects were later discovered, with the aid of mathematics, to give the impression of impossibility, such as impossible structures and impossible motions. 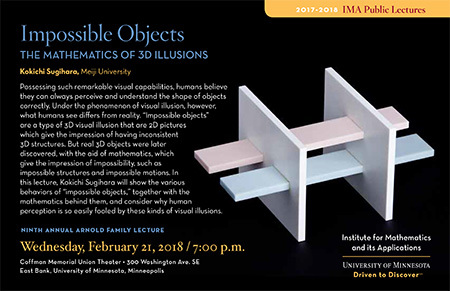 In this lecture, Kokichi Sugihara will show the various behaviors of impossible objects, together with the mathematics behind them, and consider why human perception is so easily fooled by these kinds of visual illusions.